What got them started in ASPI? When Leah was not able to make the dates for the Missoula Theater, a friend suggested that they check out ASPI. It was something Leah really wanted to do, so Suzie and Leah both auditioned and got roles in the 2007 production of Snow White and the Seven Dwarves. How does it feel to be involved in ASPI as a family? What draws them to ASPI? What would they say to other families about getting involved in ASPI? The Wons family enjoys sailing and traveling. Leah is currently pursuing performance as a career majoring in musical performance at Viterbo University in La Crosse. Sophia is also involved in Missoula Theater and Destination Imagination. Bill has also been involved in performances at St. John’s Lutheran Church in Little Suamico. 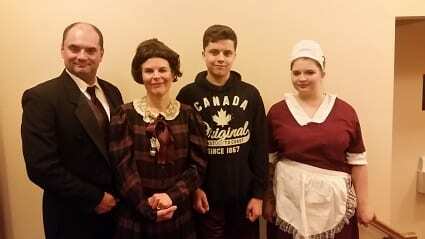 The Wons family was recently in ASPI’s production of ANNIE on March 31st, April 1st, April 2nd and April 7th, April 8th, April 9th. This entry was posted in Uncategorized on April 23, 2017 by packerland. The family’s first play was Bah, Humbug in the winter of 2009. Debra helps with costumes, makeup, and hair and is also the board’s Vice President and resident choreographer. David is involved in tech and is also a board advisory member. Liz has performed in many shows and helps with costumes. What got them started at ASPI? The Jolly family likes to travel and watch old movies and musicals. David and Debra met on the stage in ’76 when he volunteered for a ballet she was involved. “So Elizabeth had no choice but to be involved in theater. It was inevitable,” says Debra. Liz graduated from St. Norbert in 2012 and studied acting at the American Academy of Dramatic Arts in New York where she graduated in 2015. 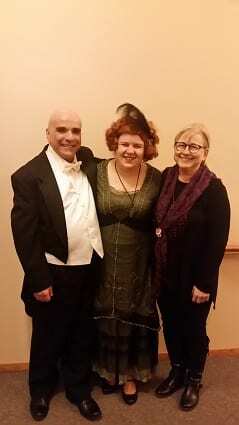 Recently Liz was Miss Hannigan and David was Daddy Warbucks in ASPI’s production of ANNIE on March 31st, April 1st, April 2nd and April 7th, April 8th, April 9th. This entry was posted in Uncategorized on April 20, 2017 by packerland. Introducing a Multi Show package deal for our patrons! Now available- purchase a Multi Show Pass and receive a discount. The discount results in $2 off per ticket per show. Must purchase the pass through the Box Office (not redeemable online). This pass expires 18 months from the date of purchase. The Multi Show Pass can be used on any shows with in the 18-month time frame. Call the box office at 920-826-5852 for more information or to purchase. This entry was posted in Uncategorized on April 17, 2017 by packerland. Join After Dark Productions, an education based theater group, for their rendering of The 25th Annual Putnam County Spelling Bee. 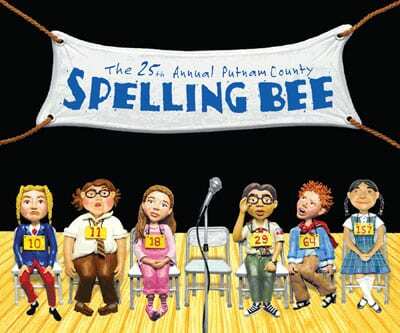 This 2005 Broadway production is a one act musical comedy that takes place at Putnam Valley Middle School as six middle schoolers compete in their annual spelling bee hosted by three eccentric adults. The show is sure to be a good time as the audience is brought into the outlandish world of Putnam and its quirky inhabitants. Did we mention that the middle schoolers are played by adults? Each show is bound to be different each night because the actors improvise based on the participation of the audience. It will be “adult night at the spelling bee” meaning that the festivities and humor are intended for an adult audience. Kari Devine will be the director of the upcoming production The 25th Annual Putnam County Spelling Bee! Kari has been involved in theater since 1999. She got her start with St. Norbert College’s Knight Theater and since then has brought her talents to Shawano, Waupaca, Green Bay, and Oshkosh. Kari has also been involved in the technical side of ASPI and she played the role of Sister Mary Hubert in the 2015 production of Nunsense. The Producers, Kiss Me Kate, Beauty and the Beast, Little Shop of Horrors, Nunsense, and You’re a Good Man Charlie Brown. When not working in the theater, Kari is a training specialist at Thrivent Financial in Appleton. 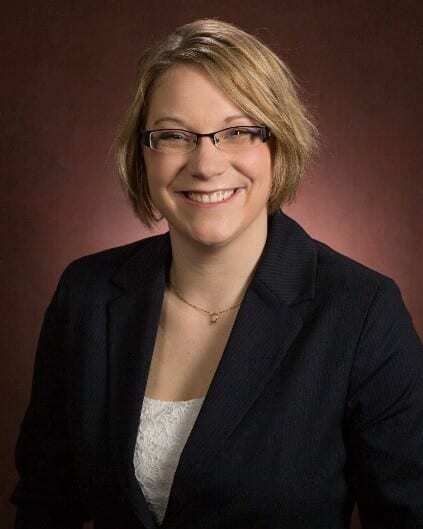 She also works as a band and music consultant for competitive marching bands in the Midwest and as a judge for Wisconsin School Music Association’s competitive marching. In her free time, she enjoys spending time with her dog, Ringo, and in the summer, she enjoys helping her family who race stock cars and trucks. If you would like to be involved in the quirky musical comedy The 25th Annual Putnam County Spelling Bee, auditions will take place Tuesday April 25 and Wednesday April 26 from 6 to 9pm at the Byng Community Theater. Come prepared with a two-minute section of a song NOT from the show and wear comfortable clothes for a practice choreography routine. For more information, or if you have any questions, please feel free to call or email director Kari Devine at 920-378-677 or devinemusical@yahoo.com. Open auditions will be held from 6-8 p.m. June 6th or 7th at the Byng Community Theater, 5852 Maple St., Abrams. Callbacks, if needed, will be from 6-8 p.m. June 8th. Performance dates will be August 4, 5, 6 and August 11, 12, 13 with rehearsals Sunday and Thursday evenings beginning June 11. Prior to auditioning, performers should consider their availability to attend rehearsals and performances. This production calls for 6 adult female roles of various ages. No actors under the age of 17 please. No pain, no gain. We all know this phrase. We hear it often in the sports world. Want that first-place trophy? Work for it. Olympic Gold Medal? Train. Superbowl ring? Team effort. In the theater, it’s no different. NO PAIN NO GAIN. This phrase was evoked during our recent production of Annie. Late rehearsal nights, long work days, endless production meetings resulted in one of the most successful productions ASPI has seen in its 14-year history. The production of Annie started at the beginning of January with auditions, where 30 people came out prepared with a song to be a part of this musical. Men, women, and KIDS! So much talent came to the theater to audition, that it was difficult to pick the little girl that would embody the title character of Annie. 4 little girls were called back to vie for the spunky little red head, but in the end- only one was chosen. As with past musicals, this production consisted of 3 months of music rehearsals, dance choreography, and blocking rehearsals. But the production doesn’t end here, there was also long hours of behind the scenes work- sets, costumes, and tech work! ASPI was blessed to have some of the highest volunteer numbers ever! A true team effort. With all the long hours of practice, painting, cleaning, and memorizing- show time finally arrived! And it arrived with a BANG! 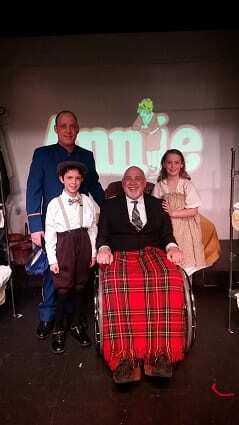 Opening night of Annie resulted in a sold-out show- a first for ASPI history. This opening night crowd set the stage and the ball rolling, resulting in a positive momentum for the remaining shows. More sold out shows the first weekend, and 2 more sold out shows the final weekend (even a wait list) resulted in record attendance numbers. We are proud to announce that our total attendance for Annie was over 1300 patrons- and we owe all our success to YOU! At the final cast party, as we put away the costumes, props, and set pieces, the cast and crew are tired, and perhaps a bit sad. Not because the pain wasn’t worth it- but because with all the rehearsals and hard work- we truly GAINED! Not just gaining in record attendance, but we all gained a family. Here at Abrams Spotlight Productions we pride ourselves on our family atmosphere and a place where community is at the heart of everything we do. Are you looking to be a part of a community? Come join our theater family! There are always spots open- come to an audition, ask about helping backstage, or volunteer to usher for one of our shows. We would love to see you join our Community Theater. You truly will GAIN by volunteering, but we will gain a new family member. They saw an ad in the paper for auditions for ASPI’s production of The Sound of Music. 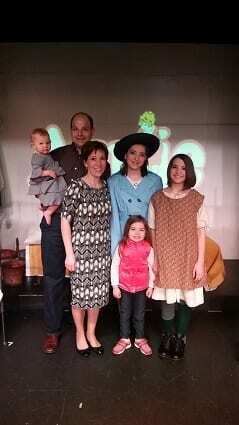 Both daughters, Ellie and Betsy auditioned and Ellie got the role of Brigitta. The Finger family enjoys spending their time outdoors in the summer, whether it is gardening or visiting their grandpa and grandma’s farm. They also enjoy playing board games together. Catch the Finger family in ASPI’s production of ANNIE on March 31st, April 1st, April 2nd and April 7th, April 8th, April 9th. For more information on the show or to order tickets, go to www.abramstheater.com or call the box office at 920-826-5852. This entry was posted in Uncategorized on April 10, 2017 by packerland. • What got them started at ASPI? • What draws them to ASPI? • How does it feel to be involved in ASPI as a family? o The Klein family enjoys tubing on the Oconto River, canoeing, fishing, and having campfires. Catch the Klein family in ASPI’s production of ANNIE on March 31st, April 1st, April 2nd and April 7th, April 8th, April 9th. 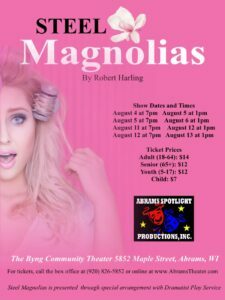 For more information on the show or to order tickets, go to www.abramstheater.com or call the box office at 920-826-5852. This entry was posted in Uncategorized on April 6, 2017 by packerland.